One of the best things to eat on a hot and humid day is this yummy Mango Pomelo Sago. I first tried it years ago in a small desserts shop in Chinatown and it has remained one of my favourite desserts till today. I’ve had this dessert many times but it was only recently that I tried making it and it’s such a refreshing treat to prepare at home. Pomelos are one of the sought after fruit besides mandarin oranges during Chinese New Year. The Chinese for pomelo (柚 yóu) sounds like ‘to have’ so they symbolize continuous prosperity and abundance of good fortune. This dessert is a good way to make use of leftover pomelos. The bittersweet taste and ‘crunch’ of the pomelo sacs complement the soft and sweet mangoes perfectly. If you can’t find pomelos where you live, substitute with grapefruit. Any ripe mangoes can be used but note that the type and quality of the mangoes will affect the taste and color of this dessert. I made this with both Australian mangoes and Thai honey mangoes on separate occasions and find that the former produces a darker and more intense color and also a sweeter tasting mango puree. Taste-wise, I’m partial to sweet mangoes and not the sour ones. If you’re using more than one variety of mango, blend the sourish mangoes for the base and reserve the sweeter ones as topping. 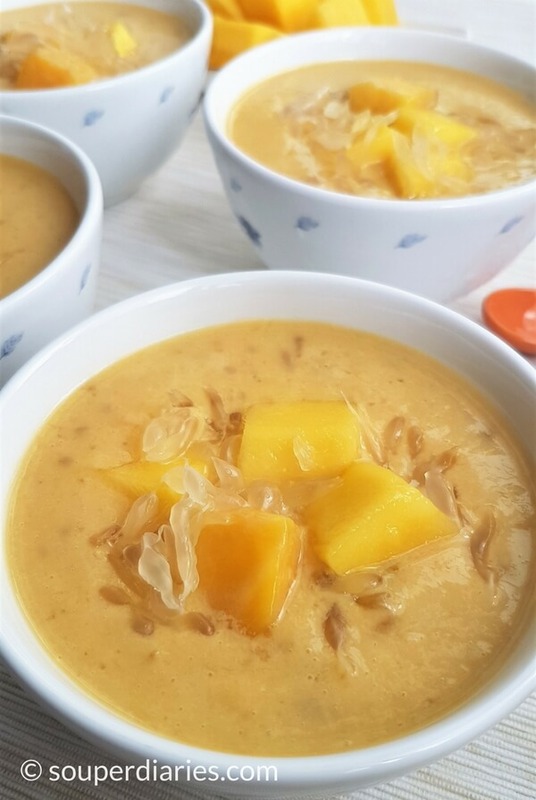 Milk is added to give the mango sago pomelo dessert a creamy consistency. Common choices of milk include evaporated milk and coconut milk. Fresh milk and condensed milk may be added too. The ratio of mango puree to milk will also determine the final taste so adjust the amount if necessary. It is very quick to prepare this dessert once everything is assembled. Are you ready? Prepare sago pearls. Put a small pot of water to boil. Once boiling, add the sago seeds. Lower heat and cook for around 10 minutes. Turn off the heat and allow the remaining heat to finish cooking the sago seeds. When the sago seeds turn translucent, ladle up and place them in a bowl of water till ready to use. Submerging them in water stops the cooking process and prevents them from clumping. Refer to this post for detailed instructions on how to prepare sago pearls. Cut the pomelo. Slice off the top of the pomelo. Make vertical slits (about 1/2 inch thick) along the sides of the pomelo. Using your hand, peel off the skin working from the top to bottom. Peel away the white membrane from 3 wedges of pomelo and remove the pomelo sacs. Loosen the sacs with a spoon and set aside. Cut the mango. Make vertical and horizontal slits on the mango “cheeks” without breaking the skin. Scoop out the cubes with a spoon. Reserve some of the cube mango (about a quarter) and set aside for use as toppings for the dessert. Blend. Place the mango cubes, evaporated milk and ice cubes into a blender. Blend for a short while till smooth. I did not break the ice completely as I wanted some crushed ice cubes inside the dessert. You may replace the ice cubes with water if you wish to chill it in the fridge. Combine. Pour pureed mango into a large bowl. Strain cooked sago seeds with a small sieve and add into the mango puree. Add the pomelo sacs and 3 tbsp of sugar syrup (or to taste). Reserve some of the pomelo sacs for topping. Mix well. Divide. Ration into serving bowls and top with reserved mango cubes and pomelo sacs. Serve immediately or refrigerate to chill and serve later. And there you have it. A dessert that is cold, smooth, creamy, crunchy from the pomelo bits and naturally sweet from the blended mango. Just perfect. Make it when the weather is warm, make it for your loved ones, make it when you’re in the mood for a dessert. Just make it. The combination of sweet and creamy mango puree with luscious pomelo sacs make for an irresistible dessert. Prepare sago pearls. Put a small pot of water to boil. Once boiling, add the sago seeds. Lower heat and cook for around 10 minutes. Turn off the heat and allow the remaining heat to finish cooking the sago seeds. When the sago seeds turn translucent, ladle up and place them in a bowl of water till ready to use. Cut the pomelo. Slice off the top of the pomelo. Make vertical slits (about ½ inch thick) along the sides of the pomelo. Using your hand, peel off the skin working from the top to bottom. Peel away the membrane from 3 wedges of pomelo and remove the pomelo sacs. Loosen the sacs with a spoon and set aside. Cut the mango into cubes. Reserve about a quarter of the mangoes and set aside to be used as toppings for the dessert. Place the mango cubes, evaporated milk and ice cubes into a blender. Blend for a short while till smooth. I did not break the ice completely as I wanted some pieces of ice cubes inside the dessert. You may replace the ice cubes with water if you wish to chill it in the fridge. Pour pureed mango into a large bowl. Strain cooked sago seeds with a small sieve and add into the mango puree. Add the pomelo sacs and 3 tbsp of sugar syrup (or to taste). Reserve some of the pomelo sacs for topping. Mix well. Ration into serving bowls and top with reserved mango cubes and pomelo sacs. Serve immediately or refrigerate to chill and serve later. To make simple syrup, I melted 70 g of rock sugar in 1 cup of water. I knew I’m staring at a Chinese New Year desert when I saw pomelo in the ingredient. I’ve never been a fan of mango except for those sour ones used in rojak. And I don’t think I’m good in making desert either. I hope I’ll get someone to make it for me before heading back to work again. Maybe it can change my thoughts on mango. My fiance would love this dessert! He loves mangos. Unfortunately mangos and blueberries are the only fruits I don’t like. I will have to show this recipe to him! 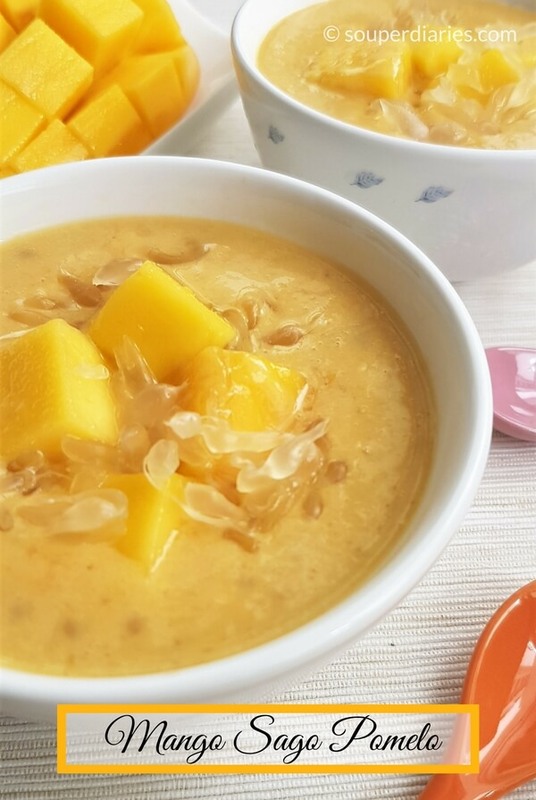 That’s a really detailed step-by-step guide on how to prepare Mango Pomelo Sago dessert. It’s a really nice dessert especially in this hot and humid Singapore. That gives you a really chilling afternoon. Thanks for this guide and I can’t wait to try it out! The picture does look delicious! I love anything mango so I am tempted to make this recipe soon. I I only hesitate because I am not sure about the pomelo- I guess it gives it texture and some contrast in acidity… Well I will let you know how it turns out. Yes, the pomelo gives it a little ‘crunchy’ texture and slight bitterness which contrasts well with the sweetness of the mango puree. I’d love to hear from you how it turns out! That looks so good! I need to try this mango sago pomelo. Your pictures really helped to visualize exactly how to do it. Thanks! I look forward to trying it! Brilliant loved the mango pomelo sago dessert recipe. cant wait to make and try this recipe. I love Chinese asian food, the freshness and flavours of the east. I am going to try this recipe for myself as i have not heard of pomelo before could you advise me where to buy this product? I will be bookmarking this page for further reference as i found this to be very interesting, i will be signing up for the Souper Diaries newsletter as well. Thanks for subscribing, Gareth. You can try looking for pomelo at Chinese fruit stalls. Sometimes I see them in supermarkets too. Finally! I knew sago could be more than one killer! I definitely have to refer your recipe to my mom as she has never wanted to try sago a second time but I’m sure this will convince her otherwise. No, it wouldn’t be the same if you replace the mango with other fruits. This is the best fruit for Mango Pomelo Sago dessert. I have never tried pomelos before but I love mangoes and desserts, I might have to make this dish soon. I’m not sure if I have ever seen pomelos in my area so I may need to use a grapefruit. This looks super simple to make once you have the ingredients, thanks Yvonne! Yes, it’s really simple to make once you’ve got all the ingredients ready. I haven’t personally tried using a grapefruit to replace the pomelo sacs but I’ve read that it can also be used for this Mango Pomelo Dessert. this dessert sounds and looks absolutely delicious. I’ve actually never tasted pomelos. Is it’s taste comparable to that of a grapefruit? Is sago seeds like tapioca pearls that are used in smoothies? I can’t wait to try this recipe out. Thank you for sharing your recipe. wow, that looks delicious. Is that at asian restaurants also? I have never seen it at one. And I do like my asian food. Will have to look into this. But it doesn’t sound like an overpowering dessert but like a lemon meringue kinda thing or fruit tart. much more up my alley. Thank you for sharing that tasty treat. Hi, I think this dessert is very unique. I never had this combination of flavours before. I’m trying to imagine what it tastes like. The chewiness of the sago ball and creaminess of the puree plus the sweetness of the fruit. I wish that I got the the chance to have this dish. Only if I am talented to cook. The only thing you have to cook for this dessert are the sago seeds and you don’t require talent for that. Interesting and lots of new things for me. I noticed you mentioned Sago seeds and I followed your link and did some more reading about the seed. But, what is the reason for including this seed? Does it give it a jello-like consistency? I also noticed that it is starchy when boiled. Would this be a good thing for diabetics to consume? Sago seeds add a delicate texture to the dessert and they also serve aesthetic purposes. They do not affect the consistency. After cooking and straining most of the starch will be removed. The amount of sago seeds is very little. I don’t think it will be detrimental to a diabetic’s health. I believe in eating in moderation. It both sounds and looks delicious. Does not look like it is too hard to make. How long does it approximately take to prepare and make everything? Also pretty cool to now know what pomelo means in Chinese and that it symbolizes good fortune and prosperity:-) Thanks. When making this from scratch for the first time, I took about 40 minutes. Subsequently when I made this it was much faster (about 10 minutes) as I already had leftover pomelo sacs, cooked sago and syrup. I only needed to cut the mango and blend it before combining everything. Hope that helps.